School's out and Summer is in! The kids' last day of school was this past Monday (It's super late compared to the rest of the country) and so far they haven't screamed "I'm bored!" yet. After our crazy 63-day, tour-around-Asia vacation last year, Hubby and I decided to take it easy this Summer. We don't have a lot planned for the next two months but I know that I want to keep the kids semi-occupied so they are not glued to the television or DS all day. 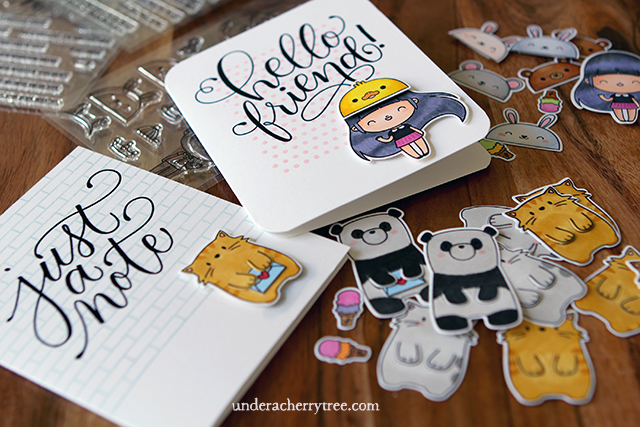 I am hoping to do some fun things with them and card-making is definitely on the agenda. While I am happy that the kids enjoy crafting as much as I do, I want to make things a little bit more interesting for them. Chibitronics seem like a great way to start. For those of you who have not heard of Chibitronics, they are the company who makes LED circuit stickers. They are exactly what I needed to make light-up cards. My kids were really excited when they saw the box of Chibitronics that I had ordered. While one of them was busy looking through the Starter Kit, I got her twin to help me make the circuit for today's card. Credit goes to Twin B for putting the circuit together! 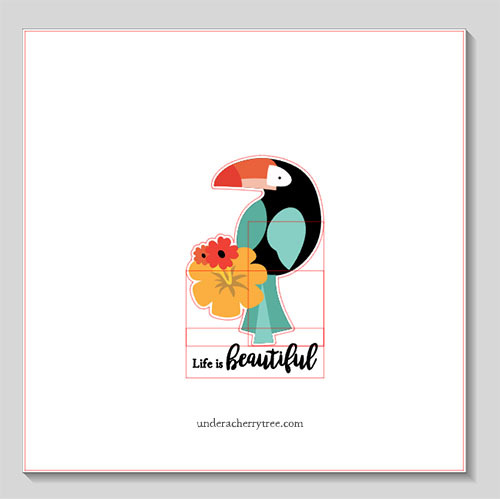 I used Silhouette Studio DE with my Silhouette Cameo to cut out all the layers that I needed to make the card. 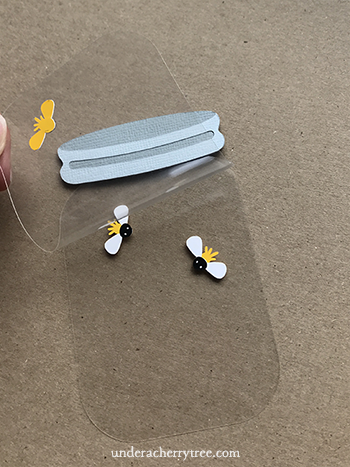 The fireflies were cut out of vinyl while the card front was cut out of acetate. 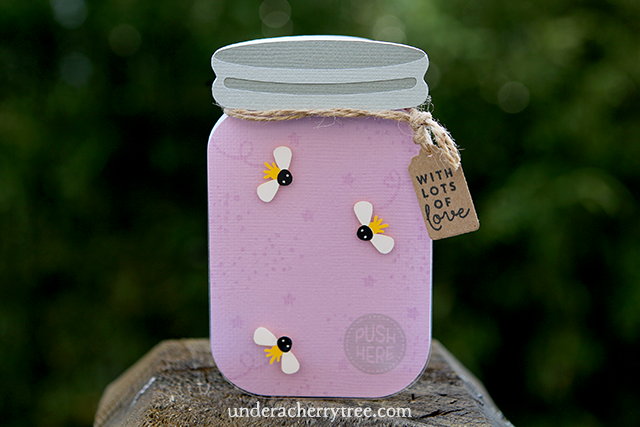 I had wanted a little more dimension for the "glass" part of the jar and so I cut out two layers of acetate to contain the fireflies- two bugs on the second layer and one affixed under the top layer so that all the fireflies are contained inside the jar. 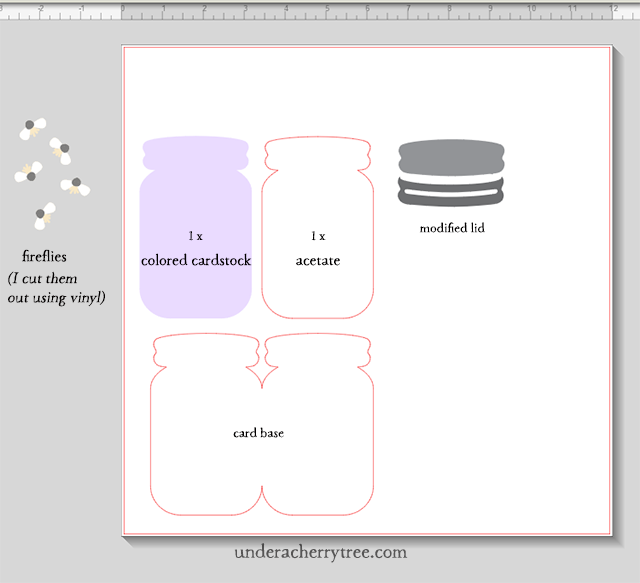 After I finished the card, I realized that one layer would have sufficed as the second layer didn't add much to the project. 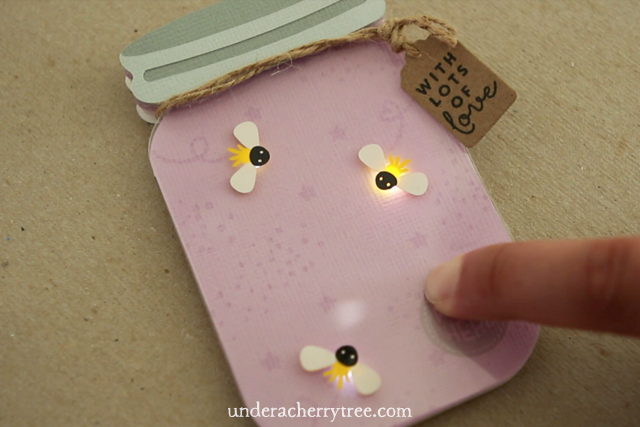 Our favorite part of the project was when everything came together and the card lights up at the touch of a finger. So fun! I am not affiliated with the Chibitronics company but I do enjoy using their products a lot. I love that my kids get to use some of their S.T.E.M. knowledge while crafting with their mother. 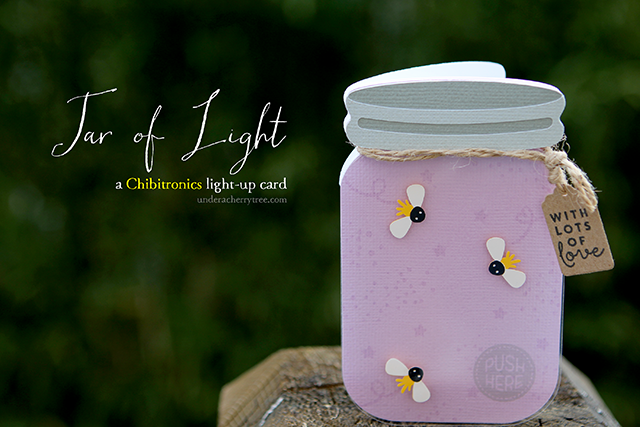 I cannot wait to make more light-up cards with them! It took me a couple of days but I have just updated my gallery. Please CLICK HERE to see which of my projects or tutorials you may have missed. Hello Friend! Just a note. 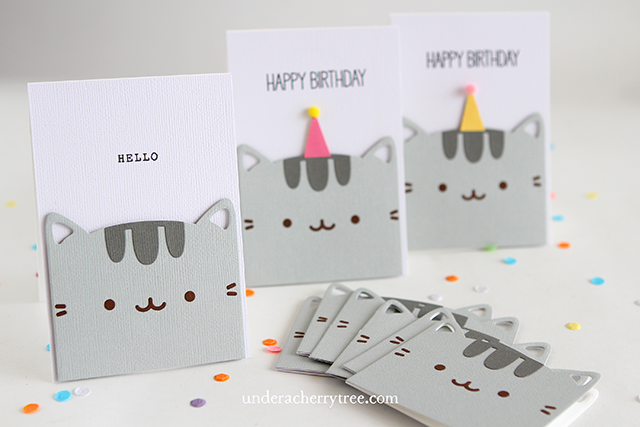 These cards are similar in style and are super easy to make. 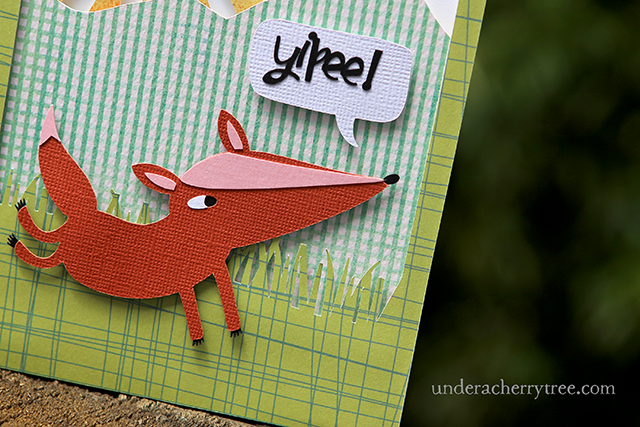 I stamped the background, let dry, and stamped and heat-embossed the greeting over it. To finish the cards, I adhered the colored image onto the card front with foam tape. If you follow me on Instagram, you may notice that I had actually posted the cat when I was playing with my Copic markers. 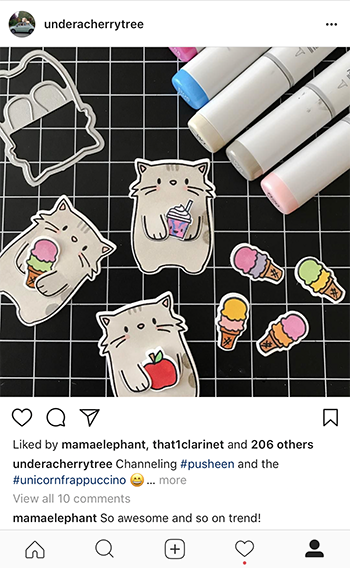 I still have not used the "Pusheen/Unicorn frappuccino" and the Panda cutouts but I probably should, eh? Anyway, hope you like today's cards. The sun is out and it is finally getting warm outside. I'm off to bask in the sun. Talk to y'all later! Muah! I am not affiliated with the stamp companies listed below but I do enjoy using their products a lot. 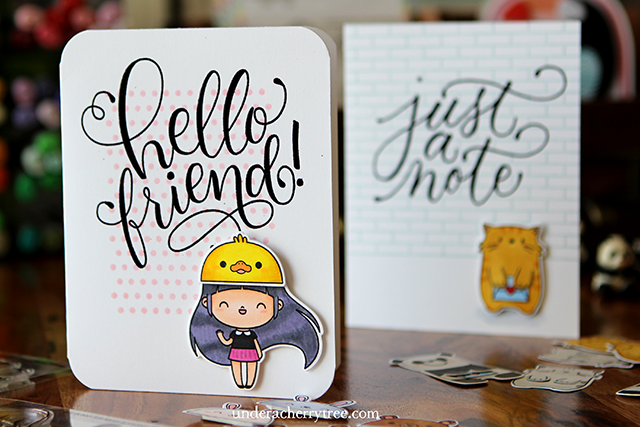 Dotted background stamps by Savvy Stamps. (bought from my local stamp store and I can't locate it online. Sorry!). I'm so happy that Summer is finally here. It feels like it has taken a long time for the season to get here. The temperature is still in the 60s today but I am so looking forward to warmer days. Hubby came home from a business trip to Asia recently and he brought me a lot of crafting goodies. My Copics collection is now complete!!! So excited!! 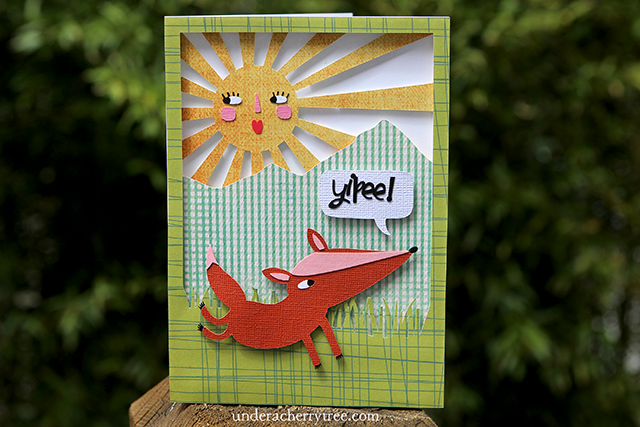 I really want to go play with my new markers but I had to make card from the new Hinterland-Summer first. 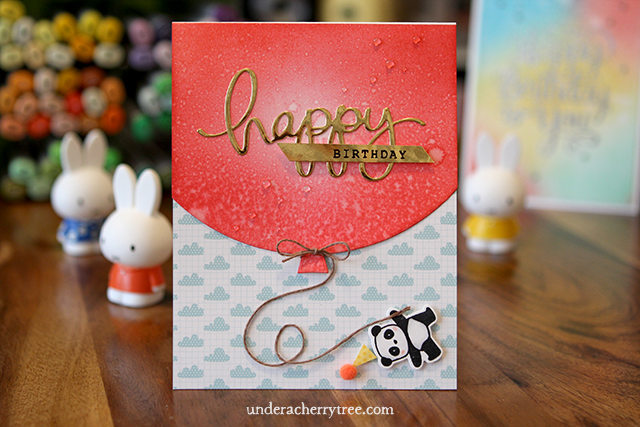 The card projects in the collection are so much easy to put together! Just cut and assemble with foam tape for lots of dimension. That's it! 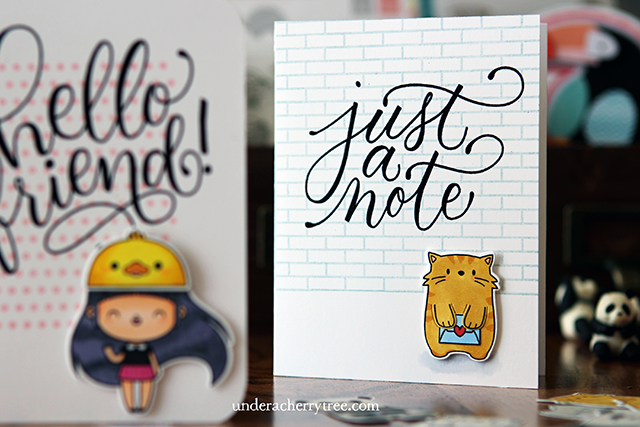 I love the whimsical look of the graphics in this line and I'd love to make all the cards in the card projects. But first, I'm going to play with my new markers. **Hurry! ** SILHOUETTE CAMEO PRICE DROP! Only $134.98 !! HURRY!! The Silhouette Cameo 2 is on sale for only $134.98 with free PRIME shipping. That's like 55% off the list price of $299! Awesome deal! I don't know how long this offer will last so if you are looking to get this machine, hurry and grab it before the price changes. I've been playing with my stamps and markers so much lately, I thought my Cameo might have gone into deep hibernation. We are 8 days away from the first day of Summer and it is still wet and cold here in Seattle. Alexa says that rain and fog is in today's forecast and temperatures will only reach a high of 60 degrees. Seriously?! Anyway, I was looking at LD's latest release and I was so excited with their Get Your Float On, I just had to wake my Cameo up. 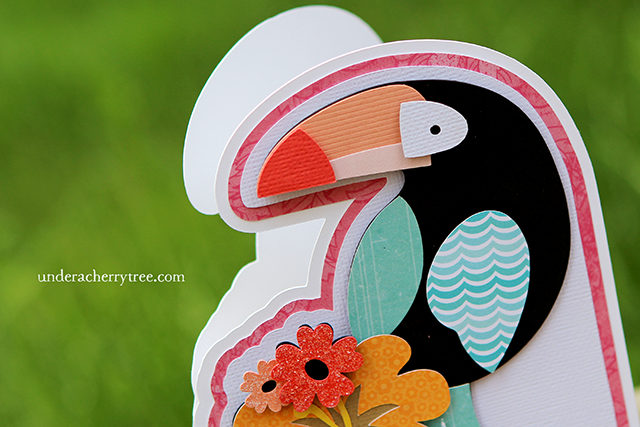 It's been a while since I made a shaped card and that toucan cut file was simply perfect for one. 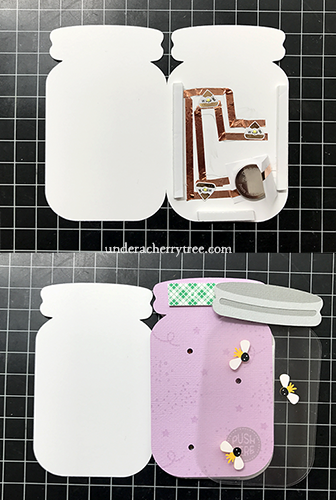 Using Silhouette Studio (DE), and the method that I illustrated in one of my earlier video tutorials, I made the (shaped) card base. 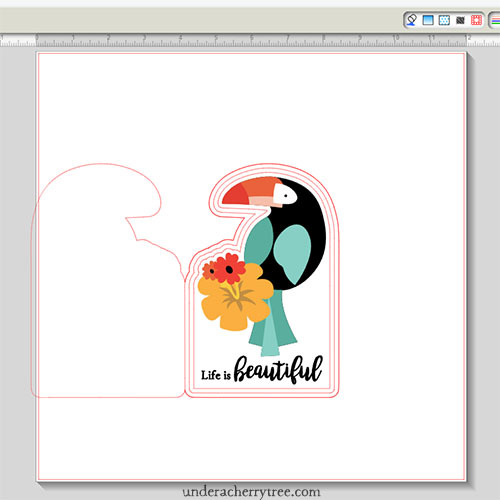 I cut out and assembled the layers for the bird, and printed out the sentiment. The card didn't take long to make although I did spend most of the time trying to find the right cardstock for it. I'm quite happy with how the card turned out. Frankly, it's hard not to like shaped cards. 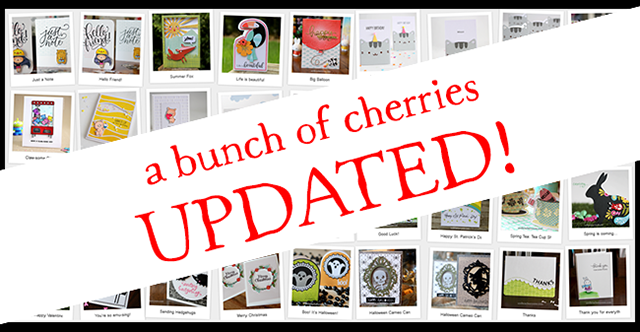 Every shaped card is different and it's a refreshing change from the same old square or rectangle cards. If you have not made one with your electronic cutter before, I hope you'll give it a try. If you need help, just check out this video tutorial. That's all for now. I'll talk to y'all later! We are into the last few weeks of the school year and I have trying to declutter and organize as much as I can before summer break begins. The decluttering process is taking a much longer time than I expected. I keep finding things that I have forgotten. FUN things. You know, like metal dies and stamps? Yeah, these kind of things always make me stop and play a while. 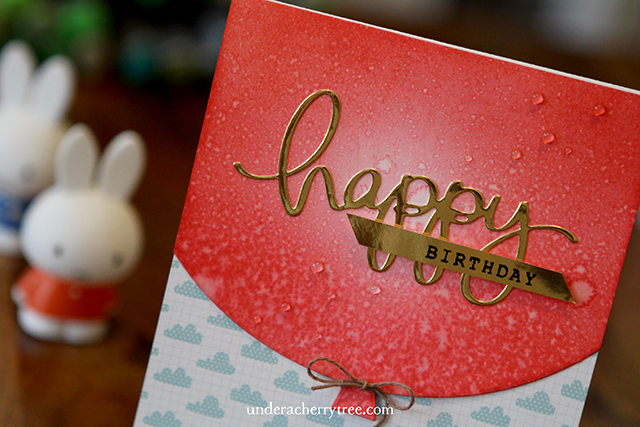 To make today's card, I cut out one edge of a 4.25" x 11" piece of cardstock with the balloon edge die by My Favorite Things. I masked the back of the card base and colored the front with distress ink. 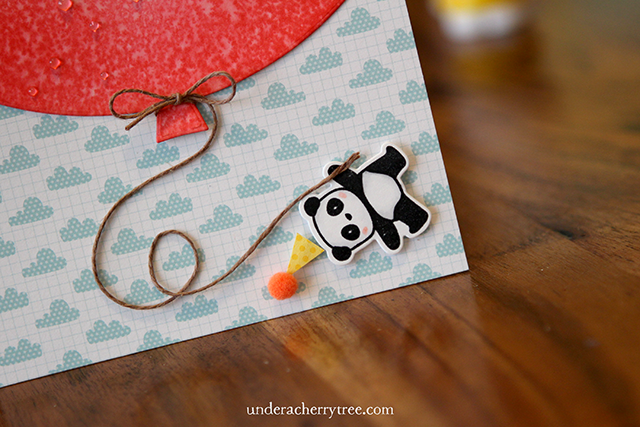 Next, I adhered a 4.25" x 5.5" piece of patterned paper under the balloon to make the card front. 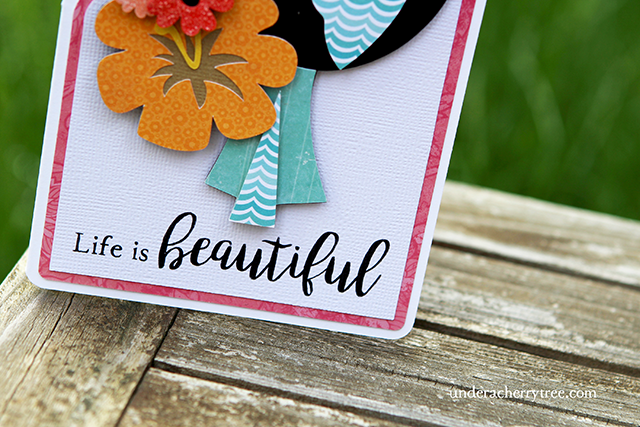 The sentiment is made up of a cutout and a stamped part. You probably can't see it from the photo but "BIRTHDAY" was heat-embossed with Versamark ink and black embossing powder. The panda bear is from a Mama Elephant stamp set. 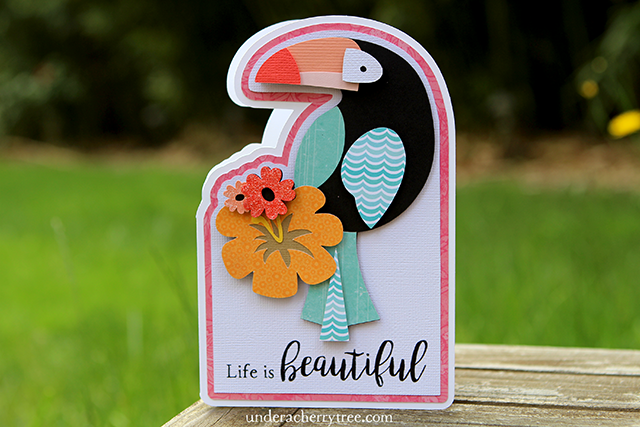 So while I was at my local stamp store the other day, I came across one of Mama Elephant's latest releases. 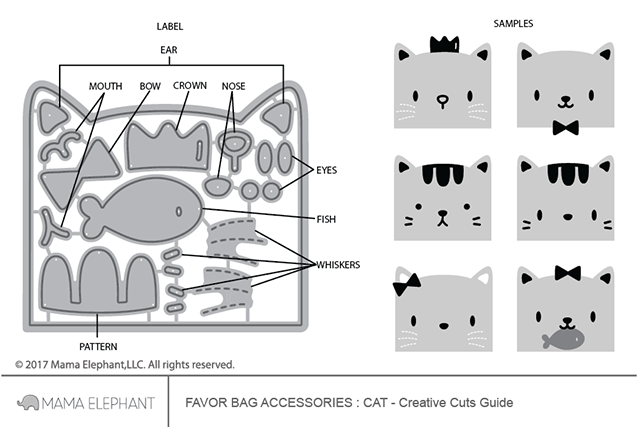 The Favor Bag Accessory (- Cat ) is a set of metal dies that you can use with a die cutter, like the Sizzix Big Shot, to cut out the different layers to make a cat. I had actually gone inside the store hoping to find the Bear version of the set but they were all sold out. Seeing that the store only had 1 last set of the Cat dies left, I grabbed them. Guide re-posted here with permission. At first, I was a little confused. I wasn't really sure what all the little parts that came in the set were for. Luckily Mama Elephant has put up a guide on their site that explained everything. The guide even included some ideas of what you can make with the set. I was thrilled! Oh lookie! 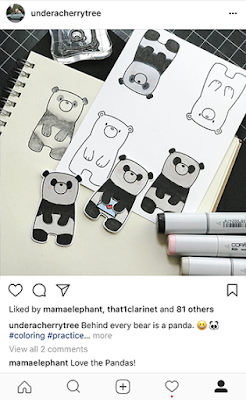 Mama Elephant shared my photo! 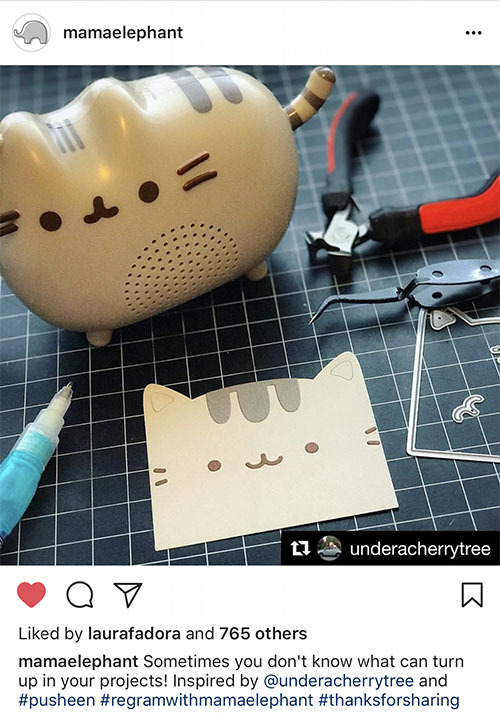 I was going to make some beige and orange cats with the dies when I noticed the Pusheen bluetooth speaker on my desk. OMG! Why didn't I think of it sooner? 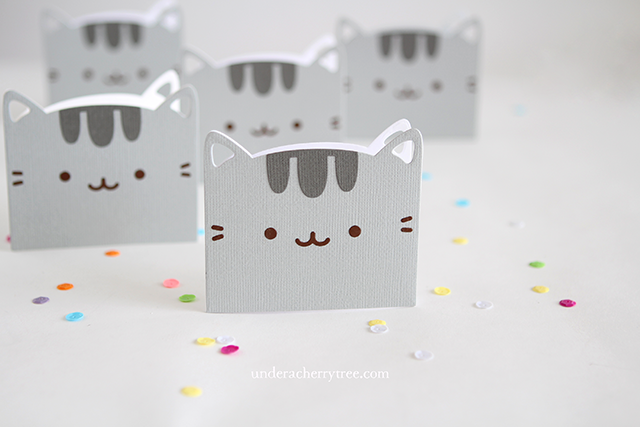 I can make Pusheen with these dies! 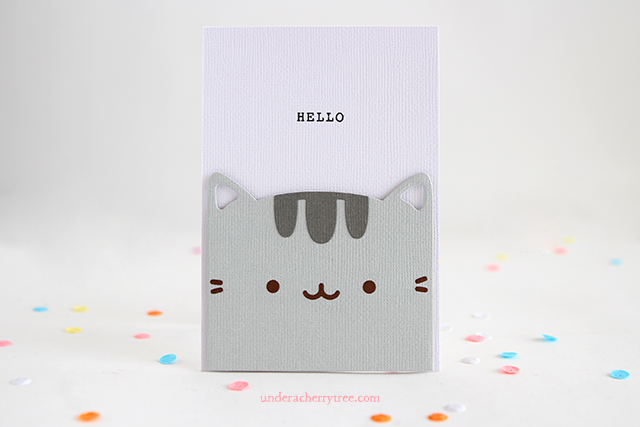 The first cards that I made with the set were these Pusheen shaped cards. Aren't they the cutest? I can use them as notecards and I'm going to slip one into my youngest daughter's lunch box. 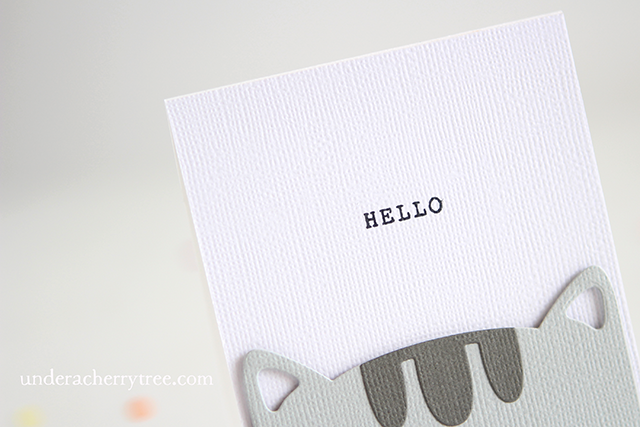 Next, I made a simple Hello card. One can never have enough Hello cards. Especially one with a Pusheen on the front. Actually, come to think of it, I seem to always run out of Birthday cards too. So I made a couple of those using the same idea as the Hello card. 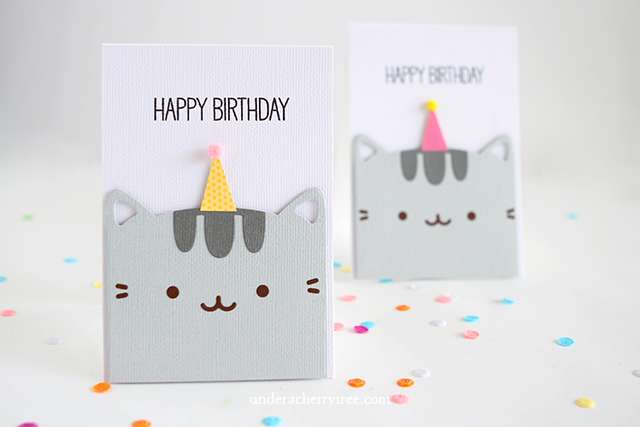 I just added a hat to the card and changed the greeting to "Happy Birthday". Easy peasy! 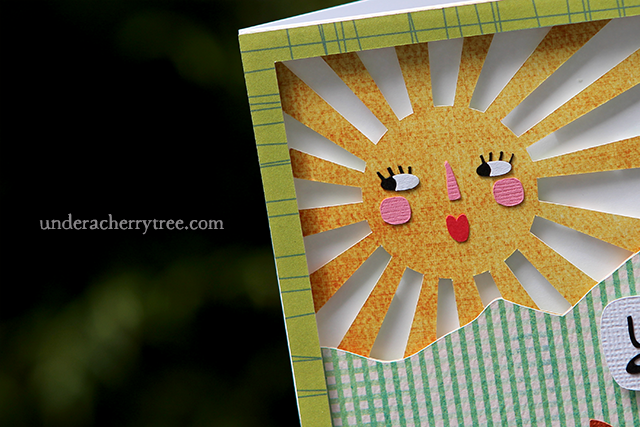 Although I enjoy using my Silhouette Cameo to make paper cutouts, these metal dies were very fun to use too. 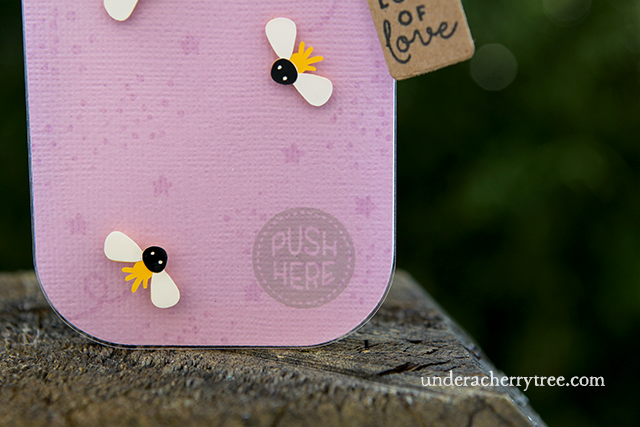 In fact, I enjoyed using these dies so much, I think I'm going to have to get the Bear and the Bunny versions. Hope I can make a panda out of one of them! "Happy Birthday" stamp by My Favorite Things.